Author(s): Enayatollah Seydi, Hamid R. Rasekh, Ahmad Salimi, Zhaleh Mohsenifar, Jalal Pourahmad. Toxicology and Pharmacology, Faculty of Pharmacy, Shahid Beheshti University of Medical Sciences, Tehran, Iran. Background: hepatocellular carcinoma (HCC) is the third cause of mortality due to cancer throughout the world. Objective: The main goal of the current research was to evaluate the selective toxicity of apigenin (APG) on hepatocytes and mitochondria obtained from the liver of HCC rats). Method: In this research, HCC induced by a single dose of diethylnitrosamine (DEN); 200 mg/kg, i.p, and 2-acetylaminofluorene (2-AAF) (0.02%, through dietary) for 14 days. For confirmation of HCC, histopathological evaluations and determination of serum concentrations of liver toxicity enzymes and specific liver cancer marker; alpha-fetoprotein (AFP) were performed. Then, cancerous and non- cancerous hepatocytes were isolated by using the collagen perfusion method. Eventually, mitochondria isolated from HCC and normal hepatocytes were tested for every eventual toxic effects of APG. Results: After confirmation of HCC, the results of this research showed that APG (10, 20 and 40 μM) increased mitochondrial parameters such as, mitochondrial membrane potential (MMP), reactive oxygen species (ROS) level, mitochondrial swelling and cytochrome c expulsion only in cancerous hepatocytes. 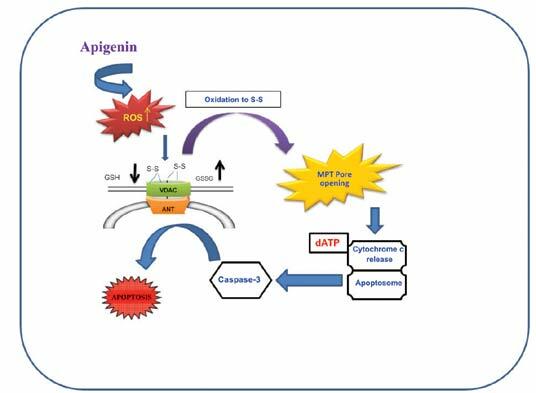 Apoptotic effect of APG on HCC cells was confirmed by caspase-3 activation and Annexin V-FITC and PI double staining analysis. Conclusion: These results propose the eligibility of the flavonoid APG as a complementary therapeutic agent for patients with hepatocellular carcinoma. Keywords: Apigenin, apoptosis, hepatocytes, mitochondria, hepatocellular carcinoma. Affiliation:Toxicology and Pharmacology, Faculty of Pharmacy, Shahid Beheshti University of Medical Sciences, Tehran, Iran. Keywords:Apigenin, apoptosis, hepatocytes, mitochondria, hepatocellular carcinoma. Abstract:Background: hepatocellular carcinoma (HCC) is the third cause of mortality due to cancer throughout the world.